The Internet has had a lot of significant effects on how sales work, but there's one effect that you probably haven't considered even though it's quite basic: moving your selling activities to the Internet means you're doing more selling in written form as opposed to verbal form. That means the ability to write effectively is more important than ever for salespeople. Your tone of voice, volume, and pitch have a huge effect on how people perceive how you speak. In much the same way, the way you choose to format your written pieces can be even more significant than the words you write. After all, if the document is very badly formatted, your prospect may toss it out without even reading it. When that happens, having the most persuasive sales pitch in the world doesn't help a bit. How you lay out and format the things you write has a huge impact on their readability. When you pick up a highly technical, difficult to read the book and open it to a random page, you'll probably see lots of long paragraphs bunched up close together, in small type. Pick up a book intended for light reading instead, and you'll probably see shorter paragraphs with plenty of space in between. Essentially, the shorter your sentences and paragraphs, the easier they will be to read. Short paragraphs give the reader plenty of breaks in between the concepts you are presenting. They keep each argument brief and as simple as possible. Long paragraphs present a lot of information in one big chunk that can be much harder for a reader to digest. The longer your paragraphs are, the more effort you're asking your readers to put in. With any kind of sales document, you want to make it as easy and pleasant as possible for your readers. That means sticking to shorter paragraphs, using a large enough font to be easily readable. It's also better to stick with a serif font, which is easier for the eye to process than a sans serif font. Include plenty of white space, because it's more restful to the eyes. That includes avoiding using right justified margins on your documents – it cuts back on white space and makes your paragraphs look denser. So how short should your paragraphs be? That depends on the nature of your sales document. Social media and "teaser" blog posts should use very short paragraphs indeed – 2 to 3 sentences per paragraph, tops. Email newsletters and sales letters can have slightly longer paragraphs, but keep them on the short side. 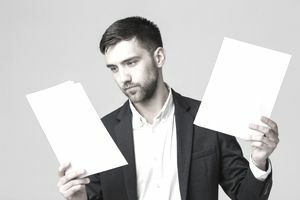 A sales proposal can have somewhat longer paragraphs since it's important for these documents to look professional; longer, denser paragraphs give a more professional feel to a document. White papers and in-depth blog posts should fall somewhere between emails and sales proposals in paragraph length. When choosing fonts, limit yourself to two different fonts per document – one font for headers, and another font for body text. Since headers tend to be in a larger font size, it's okay to use sans serif fonts for them; the larger type text makes them readable enough. Stay away from really unusual or odd looking fonts, like a cursive style or Gothic fonts, which are harder to read and can be silly looking, especially in a business environment. Using bold and italic text for emphasis is a better choice than all caps or underlining, which can also be harder to read. When you've finished writing a document, set it aside for a few hours and work on something else. When you come back to the document, pick it up and just glance at the whole thing rather than reading it through. How does it look to you? At first glance, does your instinct tell you that this document will be easy to read? Is the font big enough and simple enough to pick up some words even just glancing through it? Are the headers obvious and different enough from the body text to jump out at you? These are all qualities that you want to build into your sales documents. After all, getting prospects and customers to read such documents is tricky enough without adding to the challenge.